Developed as a further refinement of the Yak-15 and Yak-17 fighters, the Yak-23 was a private development by Alexander Yakovlev. Unlike the previous aircraft which used engines based on the BMW003, the Yak-23 used a Soviet copy of the British Rolls‑Royce Derwent V turbojet engine, produced as the Klimov RD‑500. The wings those of the the Yak‑19. The prototype Yak‑23 first flew July 8, 1947 and was determined to be highly maneuverable, with a good acceleration and take‑off and climb capabilities thanks to high thrust‑to‑weight ratio; the faults were poor directional stability at speeds around Mach 0.86 and lack of cockpit pressurization. Despite being one of the best first-generation straight wing jet fighters, it was inferior to new swept wing designs such as the contemporaneous MiG-15, and was seen as a back-up in case that advanced design did not pan out. The Yak-23 entered service with the V-VS in October 1949 and was ordered for export the following year. 310 aircraft were produced by the time production ended in 1950. Small numbers of Yak-23s were were exported to Czechoslovakia as the S‑101, Bulgaria, Poland, Romania and Albania. 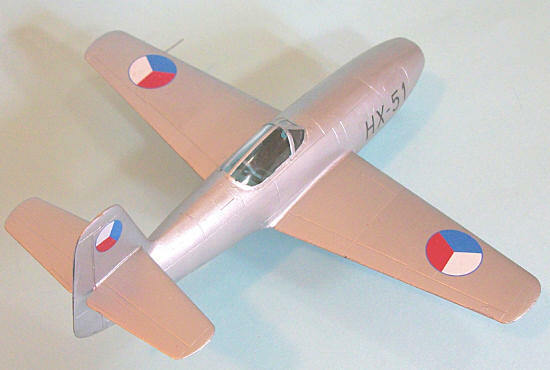 While both Poland and Czechoslovakia acquired production licenses for the Yak‑23, none were produced since the MiG-15 had proven itself a major success. In November 1953, U.S. intelligence acquired a Yak-23 whose pilot, Mihail Diaconu, had defected from Romania to Yugoslavia. After testing with fake U.S. markings by the Air Force Test and Evaluation Center at Wright Field, it was repainted in its original markings and returned to Yugoslavia. On September 21, 1957, Polish pilot Andrzej Abramowicz set two FAI world records in a Yak‑23 with civilian markings SP‑GLK, climbing to 3,000 m (9,843 ft) in 119 seconds (4,962.6 ft/min) and 6,000 m (19,685 ft) in 197 seconds (5,995.4 ft/min). Withdrawn in 1961, this was the last Yak‑23 flown. Several Yak-23s can be found in air museums in Russia, Poland, the Czech Republic, Romania and Bulgaria. 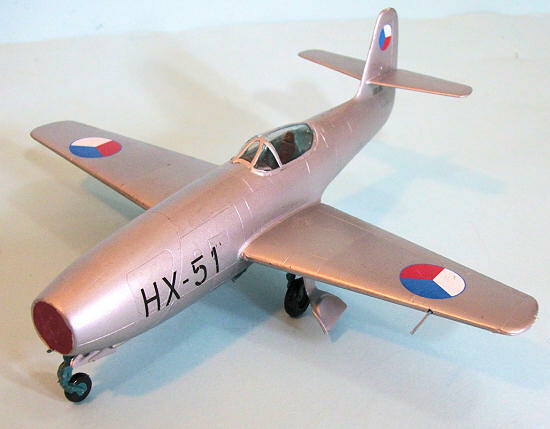 This limited-run kit by Bilek is the first injection-molded kit of the Yak-23 in this scale. A much more expensive resin kit has been available for several years. The kit provides a basically-accurate cockpit, the complex main gear is adequately created, and the thick canopy is quite clear. Photo-etch is provided for the instrument panel and seat belts. Decals provide markings for the Yak-23s in the Russian, Polish and Czech aviation museums, as well as U.S. markings for the clandestinely-tested aircraft. This kit from Bilek is limited-run, and is at about the level of kits produced by MPM. The cockpit is basic. A modeler wanting to detail the cockpit should consider it to be essentially the same as any late-production cockpit for a piston-engined Yak fighter of World War II, and detail it in that way. The instructions are about as clear as one usually gets from an Eastern European limited-run kit, so some experience with previous kits of this type is helpful. Fit is so-so. From the experience of another modeler, I made sure to attach the wings to the fuselage halves before assembling the fuselage, to insure goo fit. Since this model is going to be displayed in a glass case out at Planes of Fame, I did not do anything to the cockpit other than assemble what was there, painting it in the standard Soviet blue-green. With the thick canopy attached, there is not much fine detail to be seen, so this works fine. A modeler who wants to detail this area would do well to have the ability to vacuform or smash-mold the canopy to get a thin one that could be posed open. All the seams and attachment areas needed putty. I applied white plastic putty and sanded smooth, then polished the model and rescribed detail. The nose intake does not fit well, so I hid that fact by making an intake cover and gluing it over the opening. I gave the model a primer coat of Tamiya Flat Aluminum, then painted it with Auto Color Aluminum base, then used the Pearlized Silver to do different panels. This is a subtle finish that is probably more easily seen in person than in a photograph. Be sure to have the area where you are going to apply the decals thoroughly covered with water when you slide them off, since they want to settle fast. The decals are thin and settle easily under a coat of Micro-Sol. I assembled the main landing gear, which is a multi-part construction to get the complex gear and attached the main wheels and gear doors, then attached the nose gear and doors. For any modeler who wants a complete collection of Soviet fighter aircraft, the Yak-23 is an important addition, and this kit provides a good basis to build a nice model, with lots of opportunity for extra work to detail it up to the standards of other kits. It is unlikely another injection-molded kit of this airplane will be produced in 1/48 scale, and the price of this kit is attractive.